One of the most frequently asked questions I get is "What's the difference between Slimming World and Weight Watchers?" I could talk for ages about this but essentially with Slimming World, you don't have to weigh or measure anything and with Weight Watchers you do. With Slimming World you do have to track your 5-15 syns a day but everything else is eyeballed whereas with Weight Watchers, you have to track everything that goes into your mouth. Slimming World encourages exercise, but for health reasons, not to earn more points so that you can eat more food. When I was on Weight Watchers, I found myself eating a lot of their own branded food, most of which was processed and I was never full. Hence the absolute obsession I had with points and numbers. I was always starving and didn't like how even fruit had points. So I ended up not eating much fruit and using my points for chocolate instead. On weigh in days, I wouldn't let myself drink any water and honestly, it did more damage than good for me. But I know that it works for lots of people out there and they're generally people who can be strict with themselves and don't mind tracking everything. But here's the main thing when it comes to diets and weight loss plans. Most plans will work for you if you stick to it. On weeks where I've had a low number, I know it's because I didn't follow the plan properly. I couldn't stick to Weight Watchers for more than a couple of weeks. If I was able to or wanted to count calories and points, I wouldn't be the size I am, so Slimming World gives me freedom to eat what I want, within reason of course. When I feel plans are too strict, I become obsessed and consumed by it and end up quitting after a couple of weeks of being miserable. I used to panic as I was counting down points every day and spent most of my time wondering what I was allowed to eat for the rest of the day. I think this time though, the difference is with me more than with the plan. I really want it this time. After all the diets I've tried, and I've pretty much tried them all, I know I can follow this long term. It's promoted a healthier way of eating overall for me, I don't feel like I'm on a diet and most of all, I feel in control. Last weekend, Joanne texted me saying she'd watched my latest video and at the end of it, YouTube generally puts up suggested videos to watch and she clicked on my August favourites video and couldn't believe the difference in me. 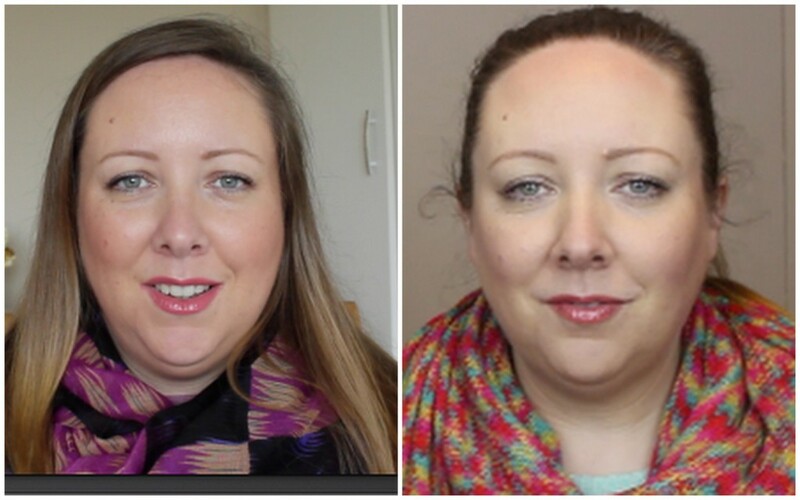 So I had to have a look and it's only when I see things like that and then make a little side by side collage that I can really see the difference in my face with just under 2 stone gone. I think I'm going to add a photo to this collage with every stone I lose and see if it keeps me inspired. When people see you every day and you're looking at yourself in the mirror every day, it can be hard to see the difference, but I can't believe how puffy my face looked and now I'm starting to get actual cheekbones! Also, I just had to say thanks to everyone who left comments about my little blockage problems ahem. I always said I talked shite on this blog and last Sunday proved me right! So this week I decided to start drinking prune juice daily and at 4 syns for 100 mls, I'm absolutely fine with using some syns up on that because it works. Ahem. I'm like a new bridie! And thank you to everyone I met this week who said such lovely things to me about how I look. I've a long way to go but you've no idea how much each supportive comment means and I've filed them all away for times where I feel like crap about myself and want to eat all the chocolate! If there's one piece of advice I could give anyone thinking of starting Slimming World, it's to plan your week out. I've started doing my shopping on a Friday evening on the way home from work after making a list of the meals I'm planning to have over the following week. I feel much more relaxed knowing what I'll be eating and where my syns will be going. Next week I'll be putting up a couple of recipes, so stay tuned for that! If you're doing Slimming World, let me know how you're getting on and what your tips and tricks are. Good luck! Onwards and downwards! well done Karen, i'm doing it on my own at the moment, I think I have WW engraved in my head, but trying to do it on my own, unlike you thoughI have half my body weight to lose but would be happy with 5 stone loss (at the moment i'm on 5 lb), so it's going to be tough, not even my sister's wedding in May spurred me to lose weight but booking a holiday to Tenerife in June has finally helped me get in the frame of mind, I haven't bought a bottle of wine in a month! let me tell you that's saying something! Well done karen,its giving me the kick in the arse i need to get myself back on this plan again. Delighted it is working for you! I really look forward to these posts on a sunday. Can't wait for the recipes next week. Thanks Mary, I'm so rubbish at taking photos of my food as usually I'm halfway through before I remember to whip out the camera! You are doing brilliantly! Fair play!! Wow amazing work done! I really like the comparison between Slimming world and WW, I've been deliberating between joining the two and this has pushed me in the right direction. Not there just yet but your great work so far is really an inspiration! Be looking out for your recipes! Well done Doll. You are doing so well and you looked really really good when I saw you on Thursday! Keep going! Thanks Sharon! You were the person I was thinking of when describing WW in this post because I remember you saying you needed the structure :) Well done on your first stone, woo hoo! You look absolutely amazing Karen, fair feckin play to ya! Keep going hun, it's obviously working for ya!